It was with a heavy heart that I checked out of The Chocolate Tree this morning. Giovanna’s hospitality and the quiet ambience of the B&B had provided a perfect base from which to explore the Ligurian Sea Alps and the LGKS, but it was time to move on. On heading north I stopped at some abandoned buildings in an ancient olive grove – the atmosphere of the little hillside plot simply oozed memories of long days filled with hard work under the relentless sun, and I tried to capture some of that with a couple of snapshots. With no definite destination in mind I let the bike take me north, the road winding its way through the mountains past scenic villages and through stunning gorges. Again the route bore evidence of the creator’s love of motorcycling; bend upon perfect bend snaked its way up one hill only to descend headlong down the other side. Balancing ones attention between enjoying the scenery and keeping it rubber side down was tricky and the occasional dented crash barrier bore evidence to other people’s failing in this respect. 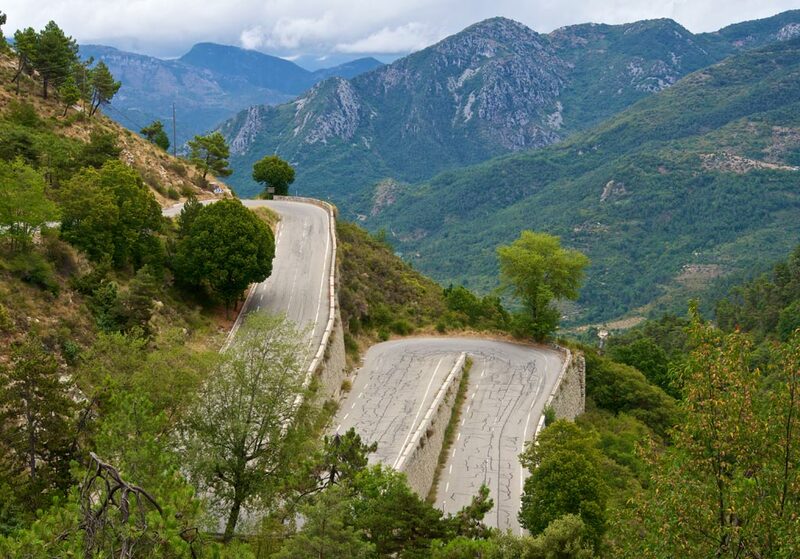 More than one series of hairpin bends sported a small shrine at the top, a sobering reminder that even the best riders have their limits. Every so often one particular vista would grab me and make riding on without taking pictures impossible. This was all very well, but with the actual distance covered already reduced through all the twists and turns it made for very slow progress, and I began to tire quickly without having gotten very far at all. By mid-afternoon my thoughts turned to finding somewhere to sleep for the night. I’d not planned anything on purpose thus far, but had instead stocked up with various culinary delights at one of the small towns along the way, hoping for inspiration to take me in the right direction. 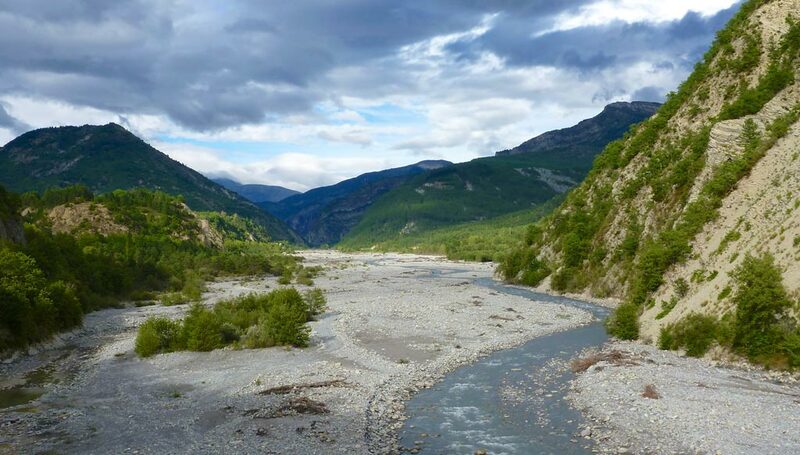 It wasn’t long before just that happened, and when I saw the wide riverbed at the bottom of the Gorge du Daluis I knew exactly where I’d be bunking down. During spring the river which had carved this gorge over the course of centuries would be a seething mass of icy water and rock, the kind where David Attenborough could film big brown bears casually flicking salmon into the air, but the start of September was its low season, and right now the riverbed was much wider than strictly necessary. The only problem was getting down there, as the road which also followed the gorge was elevated 6 or 8 meters on its own little escarpment. Ideally I would find a gap in the barrier just wide enough for a bike to slip through, complete with a gentle trail down to the pebbles. It seemed that providence had one more card up its sleeve; a run-down shack with a For Sale sign stood next to an open gateway which could only be described as ‘inviting’. As I headed on in and followed the dirt road back down the river in the direction I’d just come it became clear that this was another homestead which had fallen on hard times. Stacked against the escarpment which held the road were various terraces that must have been a garden if the overgrown fruit trees were anything to go by. 4×4 vehicle tracks leading through the old farm and down to the pebbly edge of the river hinted that I wasn’t the first person to wander down here in search of a cheap night, though there weren’t any of the usual miscreant markings like broken glass or charred remains of bonfires past, just a wide open area dotted with mature trees and a gently undulating riverbed paved with large, round stones. I chose a spot as much out of view as possible, behind some trees and up against the bank by the road, and set up my tent before inspecting the kitchen. On the menu tonight were parma ham and cheese tortellini, a tin of pilchards, a fresh baguette, two bananas, a rather fine bottle of Côtes du Rhone, and an orange for dessert. A fine meal indeed! I finished up the meal with some fresh tea and as I walked over to the river to wash up my pots and pans I was overcome with the marvellousness of it all. Here I was, a gentleman of leisure, surrounded by a breathtaking expanse of natural beauty. And it was mine for the night, at the grand expense of nothing at all. If the best things in life are free then tonight, Matthew, I’d be a king. Not wanting to push my luck by waving the head torch around as it got dark I retired early, falling asleep to the sounds of crickets doing their thing. And waking up to the sounds of wild pigs, rooting around my tent. Aren’t they supposed to be really, really aggressive at this time of year, when their young are at their most vulnerable? Maybe I was just hearing things. Nope, there it was again, closer now, a purposeful snorting sound just the other side of my flimsy canvas hide. Be calm, think it through. Logic told me it was probably just foraging for food, and immediately I thought of the empty yet aromatic fish tin that I’d responsibly stashed at the entrance of my tent. Thanks, Logic. Now Reason chipped in, and highlighted my options: be ravaged by a wild boar while in my sleeping bag, or be ravaged by a wild boar while upwardly mobile, ideally with some sort of weapon. By the time I’d not-so-silently groped around for my head torch, both Logic and Reason had run for the hills, leaving their slower, retarded sibling Instinct to pick up the tab. I’d love to know what the pig made of it all, lured from far away by the tantalising scent of atlantic pilchard, then confronted suddenly by a skinny white guy with a swiss army knife, dressed only in underpants and biker boots. The counselling will probably take years.